A friend of mine works at a medical facility where the supplies are kept in a locked cabinet to which several people have keys. My parents used to leave a gate key under a turtle shell on their porch, so their yard-maintenance contractor could access the backyard. These are just a couple of the scenarios in which padlocks are commonly used, but every conventional padlock suffers from the same shortcomings: Access is granted to whomever holds the key or the combination, and it’s almost impossible to know who’s gained access and when. And if you lose the key or forget the combination, the lock becomes worse than useless; in fact, you might have to physically cut it off to gain access to whatever it was protecting. What’s that? You don’t carry bolt-cutters with you? 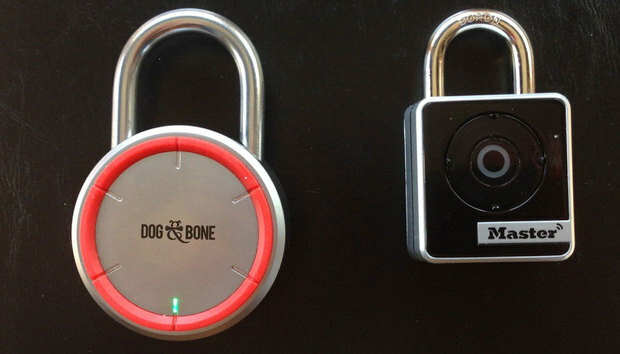 Dog & Bone’s LockSmart Keyless Bluetooth Padlock and Fortune Brands’ Master Lock Bluetooth Smart 4400 Padlock look very much like standard padlocks. Curved shackles extend from their solid bodies, and you slide the shackle through a hasp, chain, or whatever device you’ll be using to secure your property. But these padlocks don’t have keys or keyholes, and they lack combinations and numbered dials. You squeeze them shut like a conventional padlock, but you unlock them with an app on your smartphone. 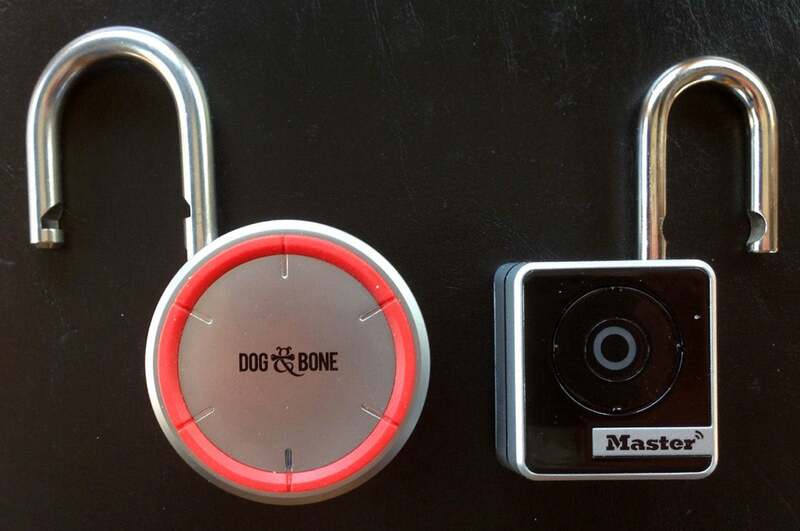 The LockSmart Keyless Bluetooth Padlock (left) and the Master Lock Bluetooth Smart 4400 Padlock (right) provide a way to both open them yourself and let someone else open them, all without a key. While you might find it inconvenient to pull out your phone and open an app just to unlock your locker or storage case on a daily basis, these locks’ strength is in their ability to provide shared access when you need it, and then withdraw that access later without having to make and hand out duplicate keys or spread around a combination. To test them for this review, I assumed that both were functional locks. They’re both solid, heavy hunks of metal, and I didn’t shoot bullets at the body or take a hacksaw to the shackle to see if I could force entry. Rather, I tried to model the kinds of scenarios described above and see how well they worked. I shared access to the locks with my son and assessed both the maintenance guy and the co-worker situations. In other words, I concentrated on the locks’ flexibility, not their sturdiness. Android and iOS apps are available for both locks, but we each used an iPhone 5c for this review. Dog & Bone doesn’t ship instructions of any type with its LockSmart Keyless Bluetooth Padlock, not even a Quick Start guide. You can download a booklet from the company’s website, but my first step was to download the iOS version of theLockSmart app (you’ll find the Android version here). The first step in the setup process is to create an online account, which I thought I’d already done with my desktop PC (simply for the ease of typing on a full-sized keyboard). But when I tried to sign with those credentials via the app, it said the credentials were invalid. Apparently they’re good only for e-commerce purposes, so I had to create an entirely different account using the app. 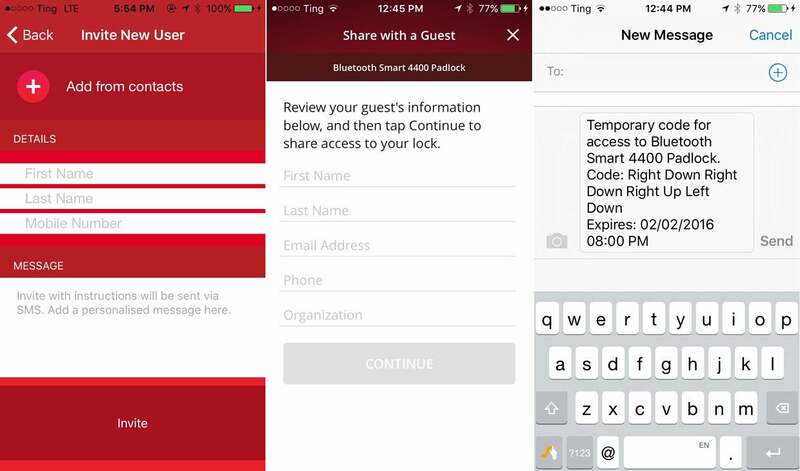 To share access to the LockSmart app, you send a text message to your guest; the Master Lock invitation is via email. The Master Lock also lets you send someone a temporary combination for one-time access. Once your account is set up, you turn on the lock by pressing a button that’s under a rubber flap that hides a mini USB port, which you use to charge the lock’s battery. You don’t lift the flap, you just push on part of it, and it took a few tries: The rubber is very stiff, there’s no click, and it’s not clear how you know when the lock is on. Finally a green LED started blinking; once the app paired with the lock, the light turned solid green. At that point, you can tap an onscreen button to unlock the lock. (Be careful—it springs open vigorously and almost knocked my glasses off my desk.) You can also set it up so you can unlock the padlock using your phone’s touch sensor or by entering your passcode. To share the lock, you enter the other person’s name and mobile number. Pressing the Invite button sends them a text message with a link for joining the lock. First, however, they must download the app and create their own account. After that, they can return to the message and click the link. Since the connection is Bluetooth, only one person can be actively connected to the lock at a time. The app automatically disconnects when you move out of range and reconnects when you’re close again, so the process is seamless. But it could be awkward in the co-worker scenario, if multiple people are working within 30 feet of the lock. Finally, there’s an Activity screen that lists every time someone locks or unlocks the lock. You can also arrange to have a notification displayed for each event. 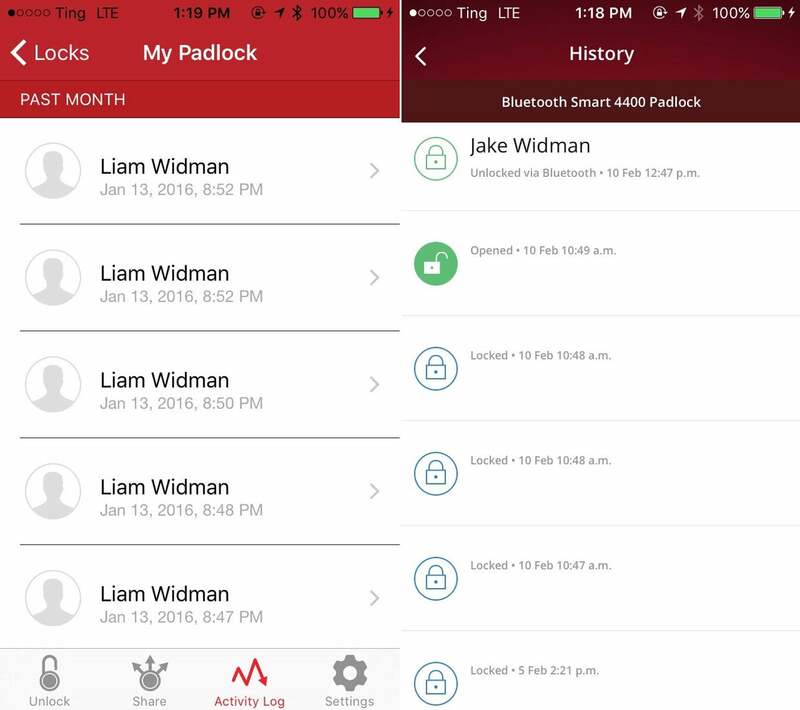 Both the LockSmart app (left) and the Master Lock Vault eLocks app (right) provide a way to see what’s been going on with your locks. Overall, the LockSmart does work. But there are several ways it could be improved that make themselves known as soon as you start using it. First, it seems like a lot to ask someone to install an app and create an account just for one-time access, like a maintenance person might need. Second, to withdraw access, you need to delete the guest from the list of users entirely. If you want to give them access again, you need to enter their name and phone number and send them a new message. (At least they’ll have the app installed this time.) It’d be nice if there were a list of all the people you’ve shared with, so you don’t have to go through all that again to send a new invitation. 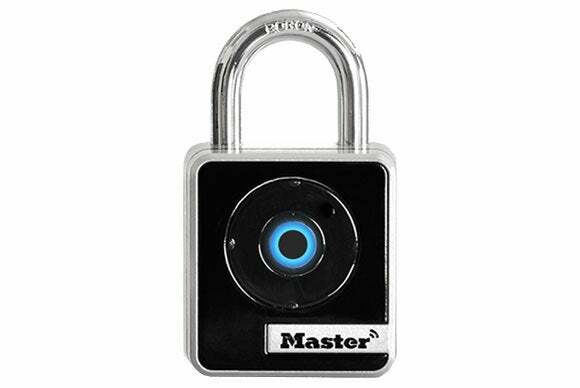 The Master Lock Bluetooth Smart 4400 Padlock and its well-thought-out app address most of the LockSmart’s shortcomings. The first thing that distinguishes the Master Lock 4400 is that it does come with printed instructions. Don’t lose them! Because the second thing you’ll notice is that the face of the lock looks like an old iPod clickwheel. It’s a four-way rocker switch that lets you open the lock manually, and the combination is printed on your instructions. Since it’s a four-way switch, the combination looks like an old video game cheat code: up, up, right, right, down, left, right, up, and so on. You can also open the Master Lock Bluetooth Smart with a sequence of taps on its face dial. The smartphone app is called Master Lock Vault eLocks and is available for bothiOS and Android. It’s not to be confused with the plain old Master Lock Vault, which is a password and document storage app. Once you have the app installed, as with the LockSmart, you pair it with your lock. At that point, from the app’s home screen, you choose the lock you want to manage from the list of all the locks you’ve set up. Once you’ve selected it, a new screen appears that tells you if the lock is locked or unlocked. If it’s locked, you can tap the screen, after which you can unlock the device by pushing any button on the rocker switch. That means you don’t have to pull your phone out to open the lock—you can take the second step and put your phone back in your pocket and then walk over to the lock. It’s both added physical security and a form of two-factor authentication. You can also set a time—up to 45 seconds—at which the lock will automatically re-lock if you haven’t opened it after unlocking it. It’s another way that makes it harder for anyone to gain unauthorized access. To manage the lock—invite guests, change the combination, view the history of who’s used it—you also need to enter the security passcode you created when setting up the app. To invite a guest, you enter their information, and the app sends them an invite via email. As with the LockSmart, they must first download the app and register, at which point they can accept the invitation. To end their access, you revoke their guest status from within the app. Unlike the LockSmart app, though, the eLocks app saves a list of former guests, so you don’t have to re-enter all their data to invite them again. The History screen shows who’s used the lock and when. If you don't physically open the Master Lock, it will automatically re-lock itself after a while. If you don’t want to go through all that, the app also lets you generate and send a temporary physical combination. Your guest will have to use the manual rocker switch to enter the code, but it saves having to download the app, and you don’t have to worry about revoking their access. It’s a good solution for providing one-time access to a delivery or maintenance person. Finally, the app also supports something called Locker Mode. In this mode, you have to use a manual code to unlock the lock—it’s intended to enable you to leave your phone in your locker without worrying about locking it in. 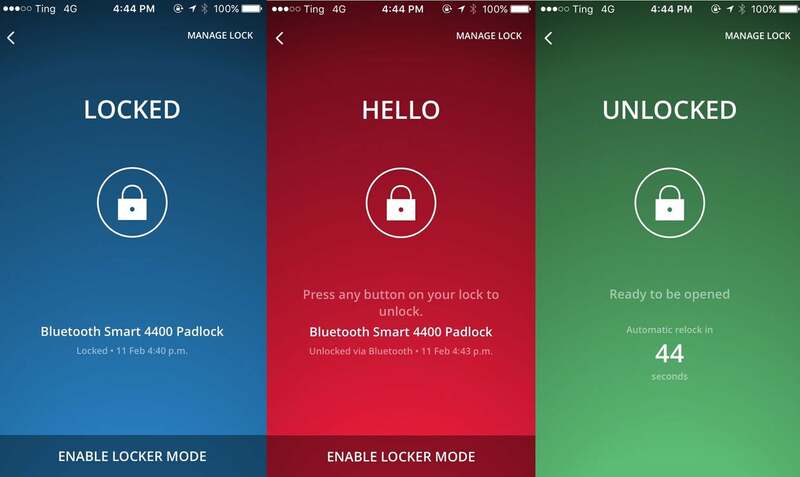 The Master Lock 4400 and its app are a good solution for the various scenarios for which you might want a Bluetooth-enabled lock. At $50, it’s significantly cheaper than the $90 LockSmart; to be fair, the latter is weatherproof, but Master Lock’s 4401 model, designed for outdoor use, is still only $60. The combination of more complete feature list at a lower price makes the Master Lock 4400 the clear winner in this matchup.